There has been a lot of speculation surrounding the future of Barnes & Noble’s digital bookstore. The bookstore is being set up with a partnership involving the Plastic Logic Reader, following a business model very similar to Amazon’s. Unfortunately, the reader isn’t slated for release until 2010, but it is still possible to try out the Barnes & Noble eBook store without a dedicated eInk reader. 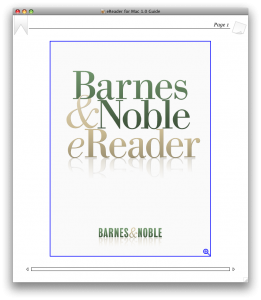 Barnes and noble has released free eReader software for the iPhone, Blackberry, Mac, and PC. At the moment, this software is the only way to read the books available on Barnes & Noble’s store. While limited to only a handful of devices, the software is supposed to be released on more platforms in the future. If you are at all curious about what Barnes & Noble has to offer, it doesn’t hurt to download the eReader. When you download the software and create an account, you also are provided with a handful of free books from the public domain and a copy of the Merriam-Webster Pocket Dictionary. While it’s impossible to make any real comparisons to the Kindle model without the release of the Plastic Logic Reader, it’s interesting to see how the competing book selections stack up. One benefit of the Barnes & Noble store is the large quantity of free public domain books provided by Google. Did you decide to check out the reader? Tell us your thoughts in the comments. This entry was posted in E-Book Readers, E-Books, Kindle Competition and tagged Barnes & Noble, Barnes and Noble, Plastic Logic by Dzmitry. Bookmark the permalink. I have used the eReader software on the Palm T|X and the Apple iPod Touch for several years before I got my Kindle. The software is a worthy competitor to the Kindle. What it lacks is the content delivery system and integration with the online store that makes the Kindle such a joy to use. I have not purchased any eReader books since it acquisition by BN but when it was operating as Fictionwise the book prices were substantially higher than the corresponding Kindle book. The one clear advantage the eReader has is that it is available for the PC and Mac Platforms a real benefit if you are using a title for work or school.